Home Canning in glass jars might seem old-fashion to a lot of people, but it is a Very Healthy and Green way of living. It's really quite simple and "yes" you CAN do it too! You will enjoy the rewards of numerous homemade meals and snacks, created from just one session. When you preserve food, you create healthy products that save you time in food preparation, a real blessing given today's hectic lifestyles. Individual jars are opened and served as is, or used to simplify on-the-spot meal and snack preparation. We would like to share with you our favorite canning recipes and techniques that have been passed down from several generations. It has always been a way of life for us and instead of running to the grocery store, we made a trip to the basement. Over the years a lot of familys have lost the knowledge that once put the pleasure of eating natural, delicious produce available year-round. 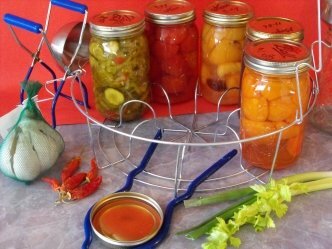 You certainly don't have to live in the country to enjoy the pleasures of canning and it is very gratifying to know that you too can preserve your own food. Please make your self at home at look around our site. We cherish your visit and hope you come back often.